From classic to quirky, there’s a wedding vehicle to suit every part of your big day, whatever the theme. Be inspired by some of the fantastic ideas discussed here. We’ve all heard the phrase ‘making an entrance’, but when better to do so than on your wedding day? After securing the venue, dress and rings, the next consideration is working out the transportation. 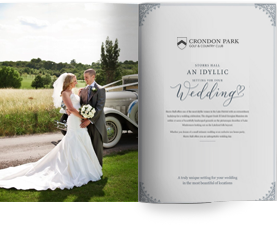 Depending on the logistics of your day, there may well be a few journeys between the bridal home and the ceremony, then on to the reception and possibly a car to take the happy couple away on their honeymoon. All eyes are on these vehicles as guests surround them to take pictures and wish the bride and groom the very best. These journeys also offer the couple a rare moment of romantic peace and quiet on what is otherwise a chaotic day. But most couples don’t just want to turn up in their mum’s Ford Focus. Some prefer the classic car look, others want something a bit quirky which can be a real talking point and something to look back on in years to come. If you’re undecided as yet, then consider the following ideas for wedding vehicle inspiration. There’s a reason that some things in life are deemed to be classic; they’re timeless and will never go out of fashion. 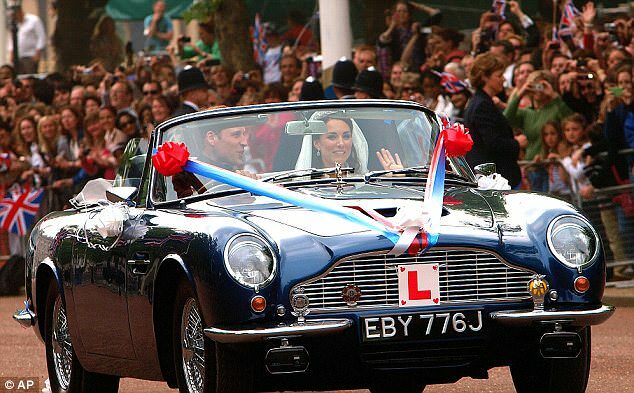 If your wedding has a sophisticated, elegant theme to it, then it’s fitting to arrive in a classic car such as the convertible Aston Martin DB6 Volante which the Duke and Duchess of Cambridge famously drove as newlyweds down the Mall. Another idea is to hire a Rolls Royce such as the Phantom which Kim Kardashian rode in to her wedding to Chris Humphries. Not only did she enjoy this vehicle, but she also ordered an entire fleet of white Phantoms to transport all her wedding guests to the reception celebrations. The car was first manufactured in 1925, but luxury models are still being made today for occasions just like these. Bentleys are another popular choice of wedding car – and for good reason with their handcrafted luxury. If you want to go for a truly stunning vehicle, then this is it. Although there are various models that you can choose to hire, the Bentley Continental is particularly popular for weddings. But if you’d prefer to make your wedding even more vintage, then there’s nothing wrong with turning off the engine completely and opting for a magical horse and carriage ride. It’s important though to do your research, as PETA report that not all companies treat their horses well, so only use reputable firms. It’s worth noting that most will have a strict maximum distance of 10 miles that they’re willing to take you. Not everyone goes for glitz and glamour on their wedding day. In fact, many couples relish throwing a rustic, laid back affair that guarantees a relaxed ambience for their guests. Wedding venues in Essex in particular lend themselves to throwing a big do in the country, due to the picturesque landscape as a backdrop to your day. But you’ll need to make sure that your wedding cars match the theme to a tee. You might choose to hire a traditional Land Rover decked out with hay bales in the back and driven by a flat-cap wearing chauffeur. Alternatively, you could select a collection of Range Rovers to transport the bride, the father-of-the-bride and the bridesmaids to the ceremony. Have them valeted and they’ll provide comfort and class for the bridal party. You can even have your favourite girly tunes on the stereo before you get there. 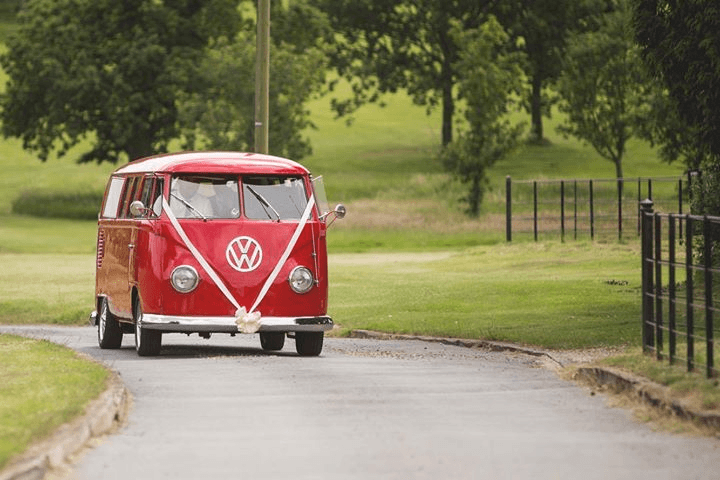 The sixties were swinging, and your wedding day will be too if you opt to arrive at your wedding day in a retro VW Campervan. If your special occasion is festival fun, with perhaps a marquee and an ice-cream van serving treats for your guests, then this is the perfect vehicle to match the mood. Campervans come in a range of colours and really set the tone for a chilled-out wedding day. For the military couples who are getting hitched, what better way to incorporate a forces theme to your big day than to hire a tank limo to get you there? Imagine the stunning photos you can take with the tank as a background centrepiece. If the groom is dressed in uniform, with buddies from the forces in attendance, then all the better. There’s nothing more annoying for wedding guests than to have a ceremony in one spot, and then being expected to make their own way to a reception venue an hour away. If you want to be excellent wedding hosts and provide those extra details that will be remembered and appreciated by all who attend your big day, then why not lay on some vehicles for your friends and family too? 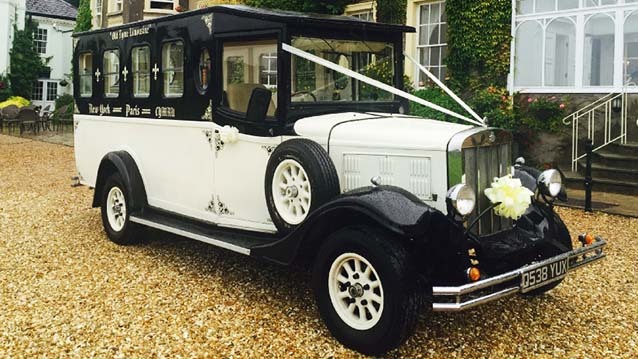 If your entire celebrations take place in the same location, then you could instead use a wedding vehicle to transport your guests back to the nearest hotel in the early hours. 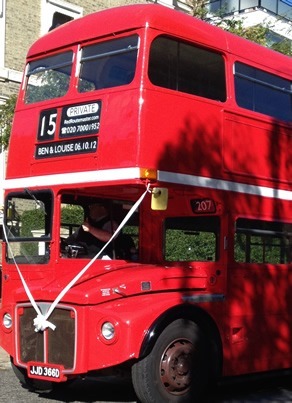 A London Routemaster bus is a popular idea – it can fit plenty of guests on it, and of course you can decorate the front with ‘Steve and Louise’s Wedding’ or ‘Mr and Mrs Hargreaves’. Another idea, taking inspiration from across the pond, is to hire out an iconic American school bus. The bright yellow colour really stands out in the photos and offers something a little different. It’s perfect for any movie buff couples out there who will be familiar with such transportation being featured in flicks such as Forrest Gump. Again, the bus is perfect for an end of night carriage to help your guests make their merry way back home after a memorable day at your wedding. When planning a wedding transport, it is always advisable to allow for extra time just in case of unforeseen delays in getting to the ceremony address and it is good for the bride to know the car is there waiting at her collection address. Didier from Premier Carriage, who provide the vintage wedding car pictured above, advise that you should depart around 10 minutes sooner than the trip would normally require. You can then choose to arrive at the ceremony venue early for photographs or the car can drive around for a few minutes before arriving on schedule. You can also park up out of sight to give the bride time to compose herself and check the mirror one last time. If there are two or more cars in use, they should normally travel in convoy. When nearly at the ceremony venue, the preceding cars will pull away to arrive a few minutes ahead of the bride. This allows time for passengers to disembark and have a few photos before their cars move away to allow for the bride’s car to stop immediately outside the venue. When planning your wedding vehicles, and indeed your entire wedding theme, it’s essential that you focus on your individual personalities. If you’re more of a Ceilidh kind of a couple then you might prefer an eye-catching, attention-grabbing vehicle that matches your laidback natures. Alternatively, if you have always dreamed of the big white wedding with formal attire, champagne receptions and an orchestra, then arriving in a Beetle might not be the way to go.